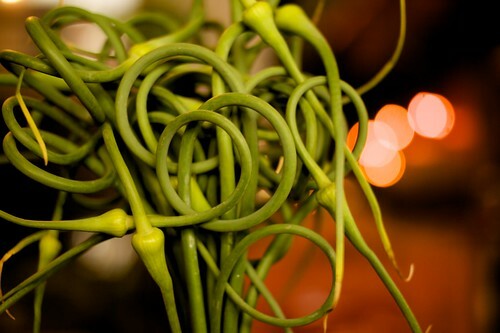 I discovered garlic scapes a few weeks ago at the farmers market. I had read the name before but had no idea what they were or what to do with them. That’s generally enough to inspire me to try something out, but I was particularly interested because of its intriguing shape. I’ve heard that a great way to prepare them is to grill or broil them, but so far I’ve only sauteed them. To date, I’ve tossed them in with noodles and sausage and Tammi stir-fried them the other night.